Sergeant Pierce died from the effects of a gunshot wound inflicted four months earlier by an armed-robbery suspect. Shortly after midnight on November 27, 1922, Sergeant Pierce and Officer George Watson were on foot patrol near 525 South Main. As they attempted to question two men matching the descriptions of a pair of robbery suspects, one of the suspects drew a gun. As Sergeant Pierce sought cover behind a tree, he was shot once in the abdomen. Officer Watson was then pistol-whipped and left for dead. The two suspects were captured the following morning. Officer Watson recovered, but Sergeant Pierce’s spine was severed. Their assailants were convicted of assault and sent to prison. 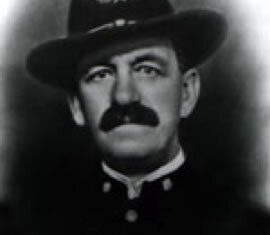 When Sergeant Pierce died, the shooter was convicted of murder and executed by firing squad February 20, 1925. The second suspect was paroled in 1926. Three months after the death of her husband, Marie Pierce committed suicide in the couple’s home. The Pierces had no children. They are buried beside each other in Mount Olivet Cemetery. Sergeant Pierce’s bronze name plaque is sponsored by Salt Lake City Police Sergeants Association.